Merry Christmas and Happy New Year to everyone. We hope you have had a safe and happy festive season. We have had a wonderful family Christmas and now we find ourselves in a new year. So what have we been up to over the past couple of months? Firstly, we have distributed the remaining Six Backpacks money to the places we volunteered at in Vietnam. $500 went to each of the children’s blind centre in Ho Chi Minh City, the orphanage and the convent in Hue, and $700 to the Kianh Foundation in Hoi’An. 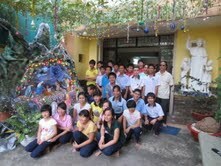 We have been able to keep in contact with the special and amazing people who operate these much needed places we visited via email and we have received some Christmas wishes from Phong, the director at the children’s blind centre, and photos taken inside their music room and outside their main building. 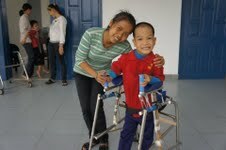 I hope we get to go back and see Phong again; such an inspirational man. I have also been in communication with Jackie, founder of the Kianh Foundation in Hoi’An who has set up a day centre for disabled children in the area. 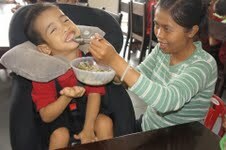 They have been inundated with requests from parents to help them with their children who suffer from autism. Even though this is not on the planning board for the Kianh Foundation, they are pooling extra money into creating a new room and support services for these families as I write this. Our money will be a very welcome Christmas present at the Kianh Foundation for this worthwhile purpose. 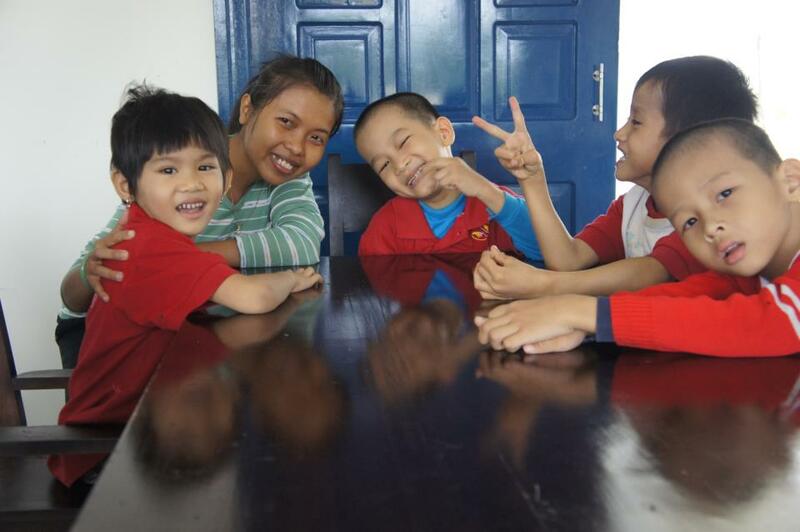 Khanh Ly (teaching assistant) with some of the children she assists at the Kianh Foundation. So I hope you are all excited about the year ahead and have dreams and goals to follow and achieve. We are super-excited in the Six Backpacks household. We’re planning our 2013 backpacking adventure to BURMA…so stay tuned for another family backpacking odyssey in September 2013.